Significant intake vitamin C, 900 mg/ sachet. Can be associated with anti-inflammatory and antipyretic drugs. Can be administered in patients with gastric or liver disease and diabetes. Ingredients: sweetening agent (sorbitol), ascorbic acid, propolis tincture, hydrogenated polyethoxylated castor oil, elderberry dry extract, echinacea dry extract, rosehips dry extract, raspberry flavour, sweetening agent (aspartame, Stevia rebaudiana extract), magnesium stearate. 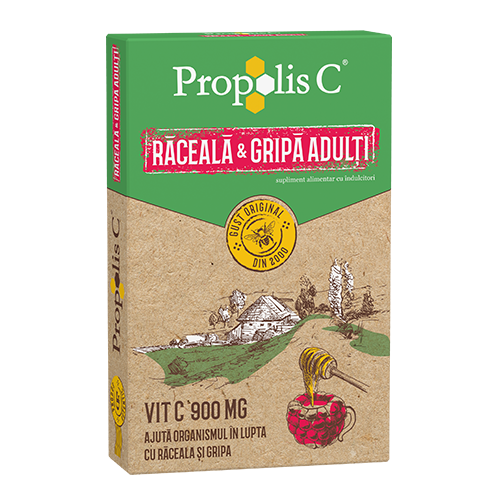 PROPOLIS C Cold and Flu Adults sachets is administered starting with the first signs of cold or flu. Before administration, the content of each sachet is dissolved in 200 mL warm water. If the symptoms do not improve within 3-4 days, consult your health care professional. - Keep the product at temperatures below 25ºC, in original packaging. Carboard box containing 8 sachets.